Homemade lindor easter egg truffles! When it comes to having a treat I’m all about quality over quantity. If I’m going to have a treat it’s going to be worth it and decadent. I’m so excited to share this recipe with you! I personally love Lindor Chocolates. My favorite are the Hazelnut Truffles. These are divine! 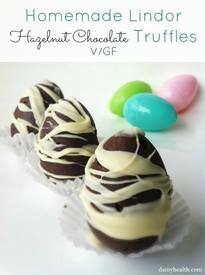 I wanted to create the Hazelnut Truffle Eggs with no dairy and just pure healthy ingredients. I’ve done it!